My visit to the Philippines for two weeks in the latter part of June to July was both for business and pleasure. It was business because I must be “about my Father’s business,” to share the gospel. It was pleasurable to see my relatives. For the trip, Pastor Wayne and our daughter, Brenna came along. The two weeks were filled with activities: visiting relatives and churches. It was a pleasant surprise that one of the families from our congregation went home as well. Brother Peter Solmantil, Sister Ruth and their three children arrived in Manila a day before. We tagged along when they visited Pagsanjan Falls and Taal Volcano. These tourist attractions were more beautiful than pictures in textbooks. They testify of our awesome Creator! The fellowship with the Solmantils was uplifting. Sister Ruth’s mother, Pastora Ha, is the administrator of two churches: Santa Rosa and Pagsanjan. Pastor Wayne shared God’s Word with the Santa Rosa congregation. 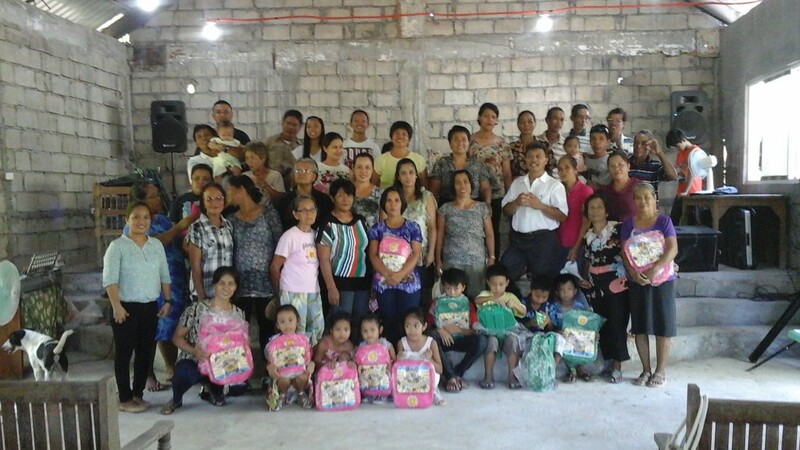 Before leaving for Isabela, Pastora Ha donated 45 backpacks to children we’ll meet along the way. The backpacks were filled were papers, pencils, and crayons. They were distributed to children at churches in Isabela and Luzong Norte, La Union. Pastor Wayne shared God’s Word on a Saturday night in Isabela with his relatives. His mother’s side boasts of having 9 Pastors in all: 3 in-laws and 6 children. What a great testimony of God’s faithfulness! The next day, Pastor Wayne taught Sunday School and preached to an FAFB church in San Agustin. People responded to the altar call. Praise the Lord! God’s provision and sustenance was evident by providing everything for us. Transportation was available in the person of Pastor Danny Ramboanga, Pastor Wayne’s cousin. He drove us everywhere we needed to go. Exotic fruits were brought to us by many. Yummy! Galatians 6:10 says “So then, while we have the opportunity, let us do good to all people, and especially to those who are of the household of faith.” We’ve gone to the Philippines to bring my father back to the US. It was a memorable trip because God allowed us to share His Word to share a little of what we have with others. It goes to show that God will use us wherever we go as long as we are willing. Praise God!